Mild: For normal to combination skin that's seeking softness and smoothness. Extra Moist: For dry and dehydrated skin that's seeking suppleness and comfort, with no tightness. Acne: For blemish-prone skin that's seeking clarity. Scrub: For all skin types that are seeking clarity, smoothness and refinement of pores. These new cleansers come equipped with the Skin Purifying Technology (SPT). SPT provides high cleansing efficiency and works to re-balance the skin; reducing oil on the T-zone and replenishing moisture on the U-zone. One of the main causes of skin problems is the penetration of harsh surfactants into the skin layers and hence, the skin's equilibrium is disturbed. SPT tackles this by not penetrating into the skin and this means minimal damage done to it. Long-term usage of SPT promises a more hydrated skin, fewer clogged pores, a reduction in sebum and lightened marks and blemishes. The Skin Caring Facial Foam Series in Extra Moist is housed in a 130g tube. You lift the orange lid to reveal and aperture from which the cleanser can be squeezed out from. Points for hygiene! :D To use it, just wet your face, lather an appropriate amount (About 3cm.) of the scrub with water and massage gently onto your face. The cleanser takes the form of a rather thick white cream, with a pleasant floral scent. All you need is a pea-sized amount (I squeezed way too much in the photo above!). 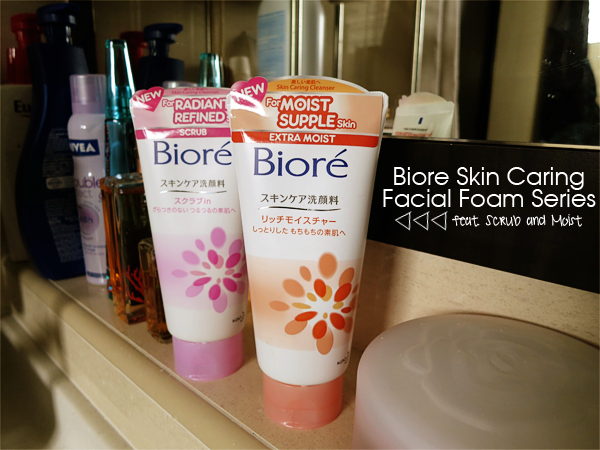 It spreads easily across my skin and feels very moisturizing. After washing it off, my skin doesn't feel squeaky clean but it does feel a little tight after a while. :\ But this could be because I just came back from winter land and so my skin's really dry now (On its way to recovery though! ).